Determining the final look of the ring, ring finishing is the last stage of craftsmanship before the ring is thought to be ready to wear, hence the name ring finishes. Ring finish is actually the treatment of the outer surface of the ring, which gives the band its ultimate look and feel. The purpose of ring finishes is to highlight the radiance of the precious metal you choose for your ring, as well as the ring's unique design. As with all jewellery decisions, ring finishes are a matter of style and personal preference, reflecting the personality of the wearer. Some reputable jeweller's offer both semi mount and finished options for many jewellery designs. If you already have a center diamond or precious stone you would like to set, you can choose the semi mount option during the customization process and purchase the item with only the side stones. This includes complete and ready to wear jewellery that is polished and set with all stones. Semi-finished jewellery is partially complete and typically set with accent gems. Due to increased flexibility and extreme variety of cost of larger gemstones (based on quality and size), the center setting is incomplete. This way, a jeweller can remount your existing gemstone, set an in-stock gemstone, or purchase a new gem based on your own preference. This type refers to a polished and set piece with side stones or melee and is complete with a fixed head. The center stone itself remains to be set. Set with side stones or melee, but with no head or center stone. The center setting itself still needs to be installed and set. This refers to jewellery which is available in different degrees of finish. A raw casting is one that needs to be sanded, polished, and, if needed, set with stones. A semi-polished piece of jewellery has been tumbled but needs a final polish and all stones to be set. A polished jewellery item is complete pertaining to finishing, but all stones still must be set if needed. Findings are components or parts used in the making of jewellery (for example, heads, earwires, basket settings, jump rings, posts, etc.). Rings are available in a varying scale of polish, ranging from polished ring finishes to rough surfaces. The three most popular ring finishes are polished, satin, and brushed. Polished ring finishes are the most popular choice among jewellery consumers, as they provide what has come to be known as a classic, traditional appearance. This is a ring finish that tends to be noticed due to its shine, hence the name "polished". In fact, polished rings finishes are so shiny that you can view your own reflection in a polished ring. 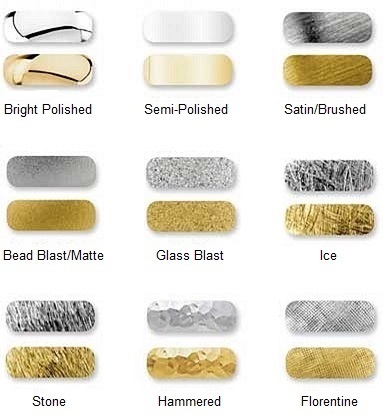 Therefore, polished ring finishes are ideal for emphasizing the luster of your ring's metal. Satin ring finishes are a close second in popularity among jewellery consumers, ranked immediately after polished ring finishes. Much like the polished ring finish, the satin ring finish is very smooth, yet it lacks the reflective quality of polished rings. Therefore, it is the ultimate choice for those who want the polished ring's smoothness, without the shine. Satin finished rings are somewhat reflective, yet rather foggy, much like a foggy mirror. The satin finish emits a gentle glow, offering a soft, lustrous, mature appearance with an almost satiny look and feel, hence the name "satin". The very fine brushed lines on satin finished rings give them the added advantage of hiding slight scratches in the precious metal of the band. Another valued quality of the satin ring finish is that it wears to a dull shine of the precious metal's natural color. Brushed ring finishes are non-reflective finishes with a subtle, tasteful shimmer. Similar to the satin ring finish, the brushed finish lacks shine. Still, what it lacks in shine, it makes up for in texture. In fact, the main difference between satin and brushed ring finishes is the brushed ring's fine shimmering texture. This ring finish is created with a texturing method applied to precious metal bands. In this process, minuscule lines are etched onto the surface of the ring in succession by means of a brush made of wire, thus the name "brushed" ring finish. Made popular by its unique appearance, the hammered ring finish is a definite crowd favorite. Known for its incredible contours and unusual aesthetics, the hammered ting finish is used to add texture to the ring's precious metal band. Using a light hammer along the band's surface, a jeweller will create a textured, distressed look designed to enhance the amount of light reflected by the ring's textured band, producing an eye catching, one of a kind ring. Applied with a practiced hand and a line graver, a Florentine finished ring features delicate, textured criss-cross patterns resembling ridged diamond-cuts along the band's surface. Florentine ring finishes were designed to add a touch of romance and sophistication to a ring, its contours and lines meant to complement a diamond center stone's natural brilliance and sparkle by reflecting light back up to the diamond center. Another element of jewellery style is design detail. From edge detailing to engraving options to the kind of finishing done during the final stage of production, the design details are truly what makes each design a one of a kind item. Lace like ornamental work forms thin wires of intricately arranged and intertwined precious metal. Options can include: plain, twisted or plaited. Filigree has been a popular way to embellish jewellery settings, creating beautiful and delicate pieces. It is a form of jewellery with classic metalwork developed in the 15th century and is still a common way to add sophistication and intricacy to jewellery. With the current interest in revisiting vintage inspired designs, filigree remains as popular as ever. Filigree jewellery has been in existence for thousands of years. Filigree designs were in use during ancient civilizations like Mesopotamia, Egypt, Phoenicia and India and some of the pieces that have been uncovered go back about 5000 years, making filigree one of the oldest forms of jewellery! In some parts of the world, especially India, the methods of creating filigree jewellery has remained virtually unchanged over millennia. Let's start with the meaning of the word 'filigree', which comes from the Latin words 'filum' and 'granum' meaning thread and grain (bead) respectively. So the main components of filigree is the fine metal threads and the little metal beads that are used together to create the design. Some popular motifs for filigree jewellery are flowers, hearts, elaborate flourishes and vines. To create filigree jewellery, the jeweller begins by stretching out the metal until it is a fine thread. These threads of metal are twisted, curled and formed into delicate lacy patterns and designs. These lacy designs are then fused onto the gold, silver or platinum jewellery or fused together to create intricate designs. The other common aspect is to include small metal beads to give the piece more character and add to the design. These separate components are then soldered together to create the piece of jewellery. Many antique filigree pieces have what is known as 'openwork filigree'. This is where spaces are left between the filigree. This is still commonly used today but is a more complicated process. Filigree adds a fine texture and appearance to any ring. It can be used in a minimalist or maximalist way, and so can be ideal for any style. Many vintage-inspired rings use filigree giving them a vintage, elegant look. Many young couples love the romantic motifs and elaborate designs of filigree engagement rings, making them a popular choice. A benefit of filigree rings is that because the metal and setting is embellished and beautiful, you can opt for a smaller diamond or go with a colored gemstone. Gemstone rings are generally more affordable than diamonds, meaning that you can cut down on the price while still having a stunning ring. The edge is expertly shaped into a fine beading. Time and time again, we see vintage designs cycle back into fashion. So it is with milgrain, which is back in vogue. With the celebration of vintage jewellery designs, milgrain is having a moment. Milgrain might seem like a very small detail, but it makes a very big difference to the overall appearance of any jewellery. It instantly adds a vintage charm and sophistication to an engagement ring, yet complements any modern design. Milgrain detailing has been a feature of jewellery for centuries, making appearances in styles around the globe. It was especially popular in Asia, which is credited for introducing this feature into jewellery. It was widely used in South East Asia, India and China. It can be said that the modern popularity of milgrain has its roots in the Edwardian era, which heavily utilized filigree and milgrain in its designs. Later on, the Art Deco era brought back this feature along with its geometric and angular designs. The name 'milgrain' (a.k.a. mille-grain, millgrain) gives an indication as to what it is. Milgrain translates to a thousand grains in French. This refers to the appearance of this feature, where tiny metal beads are placed in a close-fitting row to act as a border for jewellery designs. These little 'grains' can be made of any type of metal, but are typically crafted out of precious metals. Milgrain was commonly used to decorate and enhance antique and vintage jewellery. Milgrain detailing can come in a number of different sizes, from near invisible little spheres to sizeable grains. Some milgrain beads can be large enough to stand out as a feature in itself, while others are so tiny they may be invisible to the eye but you'll feel them when you touch the edges of the ring. The size depends on the overall design of the ring. In some cases, large and small milgrain detail can work together to create appealing designs. While most milgrain engagement rings generally have just one row along the edges of the ring, some modern designs have whole surfaces covered in neat rows of milgrain. This adds texture and complexity to the ring design, giving it an intriguing appearance and making the milgrain more than just an embellishment. It can take prominence and be the central focus of the design. • One way is to first craft the tiny metal beads and then have them soldered onto the ring design. This is a painstaking and time consuming method as each bead is individually placed into its position on the design. All antique jewellery featuring milgrain was crafted using either this or the next method. • Another way is to use a special tool that works like a mold to create the beaded pattern along the surface. This is called a milgraining or knurling tool and is used together with a milgrain wheel. • The final method, and most commonly used today, is by using a computer to design and then 3D print the milgrain pattern which is then used as a mold for the jewellery design. This is the easiest and most advanced method of the three. There are many reasons to add milgrain to your engagement ring design. For one thing, milgrain adds texture to your ring, elevating a simple design into a complex, intriguing one. You may not even be consciously aware of the milgrain detailing, but even so it will add that extra touch to your ring. Milgrain adds that vintage look to even modern rings, creating a beautiful and harmonious interconnection between modern and older eras in jewellery designs. Milgrain can act like a frame for gemstones or fancy metalwork in your ring design, promoting the beauty of these aspects and guiding your eye towards them. This is perfect for engagement rings where important aspects of the design can be subtly highlighted. For some, milgrain gives a touch of artisanship, appearing unique like a hand crafted piece, even if it is machine made. This explains one reason why many gravitate towards milgrain detailing. Milgrain detailing in engagement rings needs to be maintained in order to keep the piece looking picture perfect. The problem is that over time and with frequent exposure, milgrain can slowly wear off, losing its definition. To rectify this, the ring will need to be taken to a professional to have the milgrain restored. On the plus side, once every 10 years or so should be sufficient for this. Restoring milgrain in jewellery is also relatively inexpensive. Another issue to contend with is that dirt and grime can get lodged tightly among the milgrain beads, and can reduce the sparkle of the metal. It is necessary to clean the ring setting carefully to remove these contaminants and restore the metal to its proper shine. Mild soap and warm water together with a soft cloth or brush will be sufficient to remove dirt build-up on your milgrain ring setting. It is possible to add a personalized message to most of the ring designs. 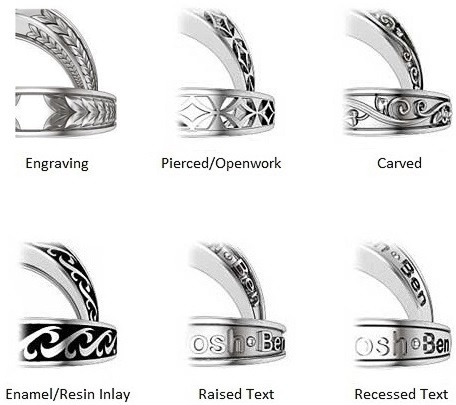 When you add engraving, you can choose from different font types and use up to 20 characters. You can view your message on a ring sample before you confirm the engraving, from the jeweller, to see how it will appear. Design Details commonly used in fine jewellery.